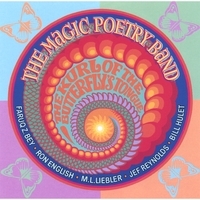 A creative ensemble of musicians, The Magic Poetry Band is the brainchild of Wayne State University professor (and St. Clair Shores, Michigan's first Poet Laureate) M.L. Liebler. Over the last twenty years, M.L. has combined his insightful, urban poetry with the funky tones of modern jazz, resulting in a perfect elision of sound and vision. Along with M.L. is Griot Galaxy saxophonist Faruq Z. Bey, The Woolies guitarist Ron English, road-tested bass player and album producer Jef Reynolds and resident drummer and gamesman Bill Hulet. I love this stuff. I wish more out there had the guts to do this kind of exploration anymore. It's like the entire creative scene as I remember it, but with a current kind of urgency. Solid.